Load type: The transistor can only have a DC load, and the relay can be used with both AC and DC loads. Current: Transistor current 0.2A-0.3A, relay 2A. Voltage: The transistor can be connected to DC 24V (generally the maximum is about 30V DC, the relay can be connected to DC 24V or AC 220V. The ability of a transistor to carry a load is less than the ability of a relay to carry a load. When using a transistor, sometimes something else is added to drive a large load (such as a relay, a solid state relay, etc.). Generally speaking, when there is a large inrush current (such as a bulb, an inductive load, etc. ), the transistor has a small overload capability and needs to be derated more. The principle of the relay output type is that the CPU drives the relay coil to make the contacts pull in, so that the external power source drives the external load through the closed contact, and the open circuit leakage current is zero, and the response time is slow (about 10 ms). The principle of the transistor output type is that the CPU turns the transistor on and off by optical coupling to control the external DC load, and the response time is fast (about 0.2ms or less). Transistor output is generally used for high-speed output, such as servo/stepping, for output with high operating frequency: such as temperature PID control, mainly used in stepper motor control, servo control, and solenoid valve control (high valve operating frequency) ). Transistors are primarily used for position control, and the output of the crystal is used to pulse. The relay can’t be pulsed, so it can’t be positioned and controlled. If you use a relay to control the positioning servo or stepping, you will need to add a positioning module, which is not cost-effective. With a transistor output, you can control the servo and so on. 5. Under rated working conditions, the relay has an action life, and the transistor only has an aging time limit. The relay is a mechanical component so it has an operational life. The transistor is an electronic component. It is only aged and has no limit on the number of uses. There are limits to the number of switching cycles per minute for relays, while transistors do not. 6. The price of the transistor output is slightly more expensive. The PLC transistor output response is fast and can be used for high-speed output. However, it is necessary to add an intermediate relay to control the solenoid valve. The relay output response is slow, but the external relay can be omitted, and the wiring is simple. The specific output to be selected depends on the load. Transistors are primarily used for position control, and the output of the crystal is used to pulse. The relay can’t be pulsed, so it can’t be positioned and controlled. 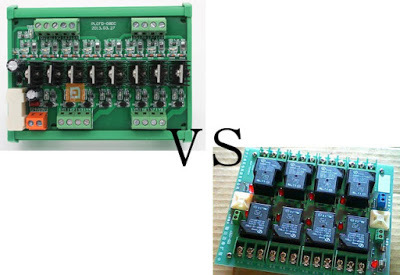 If you use a relay to control the positioning servo or stepping, you will need to add a positioning module, which is not cost-effective. With a transistor output, you can control the servo and so on. That’s it. This entry was posted in plc program and tagged plc transistor output vs relay output, relay output vs digital output on October 19, 2018 by arco.